I want to get my thoughts out of my head before they are skewed by all the other chatter that will be tossed back and forth for the next week or so on the Matt Hughes victory over Royce Gracie. I usually do not comment on MMA or things outside my training, so this will be a rare opinionated post. Please excuse me. I had high expectations for Royce Gracie to come out on top in this fight. 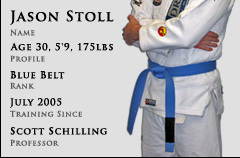 I, for many years, have put him and Gracie Jiu Jitsu on a pedestal, even as a Black Belt in Goju Ryu Karate. He was the face of closure in the age old martial arts debate of "my Dad can beat your Dad". Has the foundation been shaken? Of course it has. Because of this fight? No. The best thing that could happened for the development of Martial Arts is that Royce Gracie would lose to a "Mixed Martial Artist". The reason is; evolution never stops, in anything. We watch color TVs today while our parents watched Black and White. Our kids will probably watch something that makes color look black and white in the future. It will never stop. Gracie Jiu Jitsu of 1993 and Brazilian Jiu Jitsu of 2006 is different. Fighters are different. If we profess that ours is better than the theirs, we put ourselves in a nice, safe little box where we can be comfortable in our ignorance. Development demands impermanence. Foundations must shake and break and then be re-built. And not by us, but those crazy and fully dedicated fighters we try to be like on TV. They lead the way, as they did in '93 when this whole martial art debate went mainstream. Has my confidence been shaken in BJJ after watching this? Hell no. Every fight was won with the stuff we learn in class every week. I could see every move in almost slow motion; except for the Sanchez/Alessio which was my favorite of the night. This is because we learn what works. Is it or should it be called Gracie Jiu Jitsu? Well, that is the best label for it, so yeah. But in the end it is all called "fighting", and sometimes it all comes down to the man. Tonight that man was Matt Hughes. P.S. Nothing is as fun as having a couple Guinness and watching fights with the team. I had a blast and can not wait until the next event!